When I think of the letter A, I think of apples, and then my mind instantly conjures a lovely baked apple pie and the old Better Homes & Gardens red checkered cookbook my big sister gave me when I left home for college. Thanks to that cookbook, apple pie was the first dessert I ever made from scratch with no “parental supervision”. Believe it or not, my little studio dorm room had a small oven and not much space for anything else. Imagine rolling pastry dough on a tiny desk! Apple pie is still my favorite pie. It brings back memories of fun times with my sister in the kitchen. Since those college days, I’ve had a chance to explore bits and pieces of the world and find favorite foods, wines, cocktails and experiences everywhere I GO. Now, I want to share the fun times with you. There is no greater apple than The Big Apple! I don’t know why New York City is called The Big Apple. Google searches lead to many theories, everything from horse racing to promotional campaigns to a New York brothel whose madam was named Eve. Huh? I think it must be because apples are a super food and New York City has some of the best food choices in the world, from street food to fine dining, hidden holes in the wall to celebrity chef hot spots. No matter how many times I visit The Big Apple, every trip must include the iconic and traditional Must Eat Food of New York. You can’t GO to New York City and not get a nice bagel with lox sandwich, a big juicy hot dog, gooey cheesy pizza, piled-high pastrami deli sandwich, creamy cheesecake, and sweet cannolis. If you’re a first time visitor, this is a good list to start with. There are plenty of places to choose from and New Yorkers will debate you on which ones are the best ones. The best part is, no matter which places you choose, you can’t go wrong. 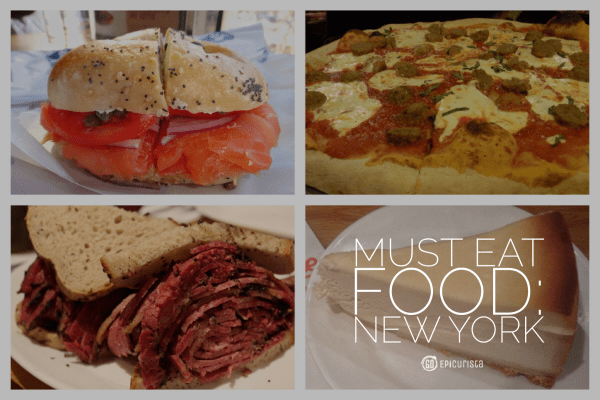 GO try the Must Eat Food of New York and find your favorites. 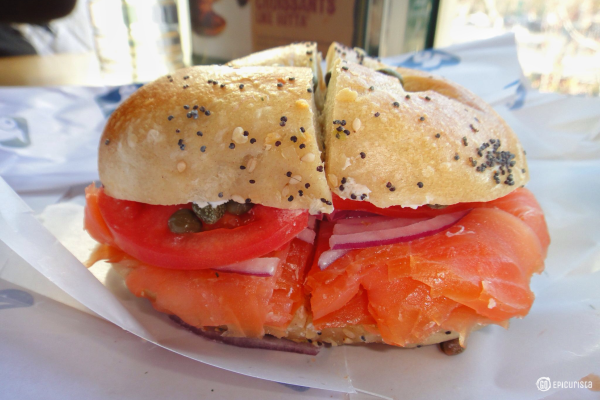 New York Bagels are like no other anywhere in the world. I hear it’s the NYC water that makes them so good. 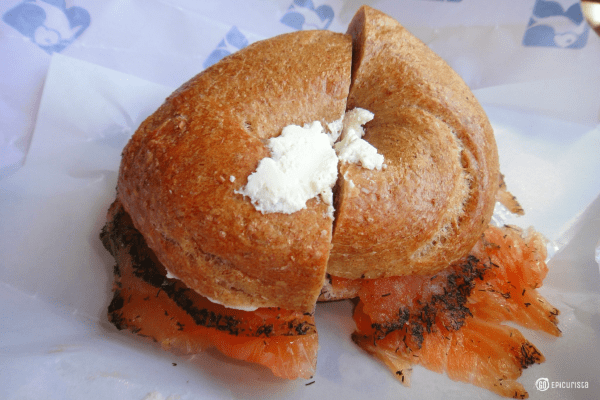 I don’t know if that’s true, but I do know a bagel in the Big Apple is a Must Eat, with its crusty firm exterior and pillowy, dense and chewy interior, perfect to be lathered with whipped cream cheese – called a schmear – and topped with smoked salmon or lox. This creation can be devoured for breakfast, lunch or dinner, and always satisfying. Judging by how crowded Russ & Daughters is, especially on a weekend morning, this is the place to get your Bagels and Lox. One of the last remaining “appetizing” shops in the country, this family business has been around since 1914, currently run by the fourth generation of the Russ family. It is as much a part of New York’s history as the Statue of Liberty. Located on the Lower East Side, get there early, take your number and prepare yourself mentally for a bit of a wait and the awesome goodness that will be your reward. The delicate layers of masterfully thin sliced smoked salmon piled on top of whipped cream cheese, briny tangy capers, thick slice of tomato, and slice of red onion on a lightly toasted bagel. Oh, there is nothing like it. Russ and Daughters offers various types of housemade salads, smoked and cured salmon and cream cheeses to top your bagels with as well as other fine products. You can read all about my memorable first visit and see more pictures on this post: Must Eat in NYC: Russ & Daughters. Russ & Daughters is located at 179 E Houston Street on the Lower East Side. Other Bagels on My Someday List: I hear the hand-rolled bagels at Absolute Bagels are amazing so it’s on my list to check out during my next visit. I may still be getting my bagel toppings from Russ & Daughters, though. 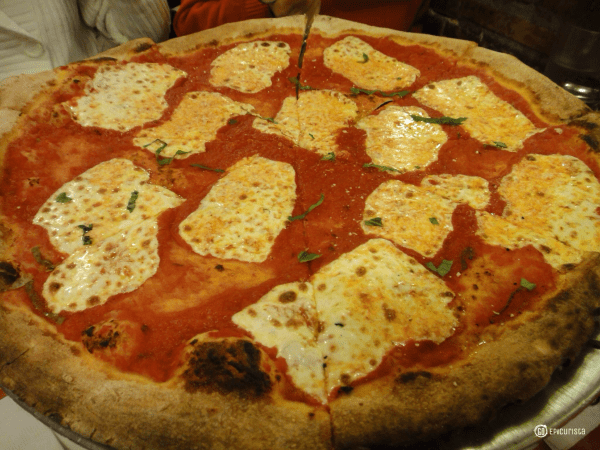 No list of Must Eat Foods of New York is complete without Pizza and New York Pizza can only be found in New York. Sounds redundant, but let me explain. I know you probably have a place in your town that says they offer “authentic” New York Pizza, and it may be great, but it is not the same. End of discussion. The New York pizza experience must include a nice crisp crust, tangy tomato sauce, gooey melted mozzarella cheese, a bit of “fuhhgetaboutit” attitude and grease running down your arm when you pick up that amazing slice. Whether you fold it or not, it is your choice, but don’t say I didn’t warn you about the grease. 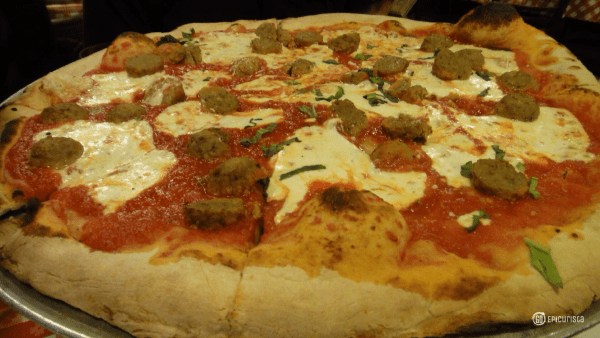 There are quite a few awesome pizza joints in New York City. Any online search will lead you to the latest “Best Of” list which I am certain are all amazing, and yet you never forget your first slice of this heavenly creation. Mine was at Lombardi’s, which is also likely to be many Americans’ first taste of pizza since it boasts the title of the oldest pizzeria in America, opened in 1905 by Gennaro Lombardi. The Original Margherita Pizza is my favorite. A simple Neapolitan pizza, without much fussing over, with only high quality fresh mozzarella, fresh crushed tomato sauce, Romano cheese and fresh basil, cooked to perfection in a coal oven resulting in a crisp, slightly charred crust. The crust is what sets New York pizza apart. The coal oven at Lombardis Pizza makes the crust smokey and charred on the outside yet chewy on the inside. The cheese will likely come off in one big chewy chunk after you wrestle it into an incredibly long string. Oh, so good I’m drooling as I write this. You can taste the fresh crushed tomatoes in the sauce with that tangy acidity and a touch of sweetness. You can add assorted toppings such as sweet Italian sausage, spicy pepperoni or homemade meatballs. However, be warned, it can get a bit pricey at $4 per topping. The menu is traditional which is exactly what you come here for. You will not find crazy gourmet toppings or combinations here. My advice is keep it simple. The thin crust can get soggy if you add too many toppings. You can also get half and half if you want to try different toppings or combine a Marguerita on one side with the white pizza with ricotta on the other. You can’t however, order by the slice. Only pies are sold here. If there is a line, don’t despair it tends to move quickly. If you can’t wait, order it TO GO but don’t miss out. Read more about this Must Eat experience in New York City in this post, which of course includes some laughs, more details and more pictures. Lombardi’s Pizzeria is located at 32 Spring Street in the Nolita neighborhood. Oh and don’t forget to bring cash, because they don’t accept credit cards. Other Pizza On My Someday List: John’s of Bleeker Street, Roberta’s and Totonnos Coney Island are on my list to try on my next visit. They are consistently found on pizza recommendation lists around town. One look at one of these deli sandwiches with meats piled-high and you know why it’s on the list of Must Eat Food of New York. These things are massive. There’s a reason people even have them shipped nationwide, but you must experience them in a New York Deli to truly get the full effect. There is nothing like that atmosphere. Even the surly attitude is part of the charm. Opened in 1937, across Carnegie Hall, it was run by second generation owner Marian Levine, daughter of Milton Parker, who was known as The CPM – Corned Beef and Pastrami Maven. Their corned beef and pastrami sandwiches are like no other, using nearly a pound of house-cured and smoked meat! Sadly, this New York institution closed at midnight on December 31, 2016, after almost eighty years of service. The famous open-style Reuben with your choice of corned beef, pastrami or turkey, topped with melted Finlandia Swiss cheese and sauerkraut or The Woody Allen with lotsa corned beef plus lotsa pastrami were popular. These creations didn’t come cheap at $17.99 – $27.99, plus a $3 sharing charge, but they were worth a try. Read all about this iconic deli and the hilarious dining experience we had there in this post. 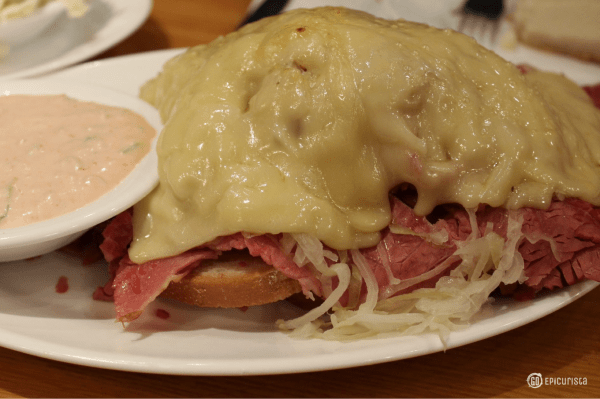 At Carnegie Deli, they seated you family style at communal tables, which in New York City is bound to lead to colorful dining companions and equally colorful conversation. Carnegie Deli was located at 854 7th Avenue at 55th Street in the Theater District. Other Deli Sandwich On my Someday List: Katz Deli is an iconic New York deli which many say rivals Carnegie Deli in both fame and quality. Although I have visited (I admit it was to see the famous “I’ll have what she’s having” When Harry Met Sally movie location) I did not have a chance to sample their amazing pastrami sandwiches. I’m definitely going on my next trip! UPDATE: I finally was able to enjoy a meal at the famous Katz Deli during my visit to New York in January 2017. The giant pastrami sandwich and those epic pickles were every bit what I expected. The experience was absolutely worth it! 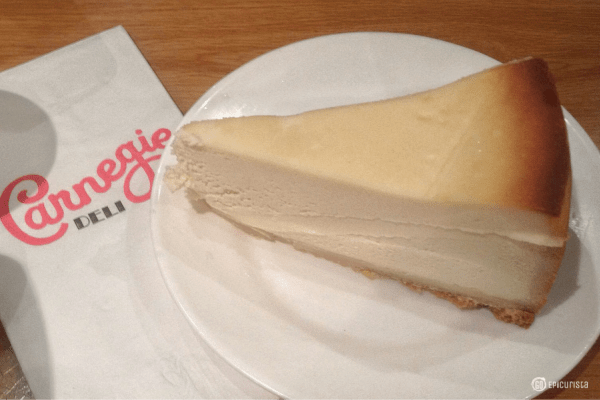 The classic New York cheesecake, with its rich and dense consistency, perfect balance of sweet and tangy flavor, best served plain although strawberries are a popular topping, is absolutely one of the Must Eat Food of New York. You will likely find it served in every restaurant in the city, yet there is one spot in particular that since opening in 1950 has been voted over and over as one of the best in town. 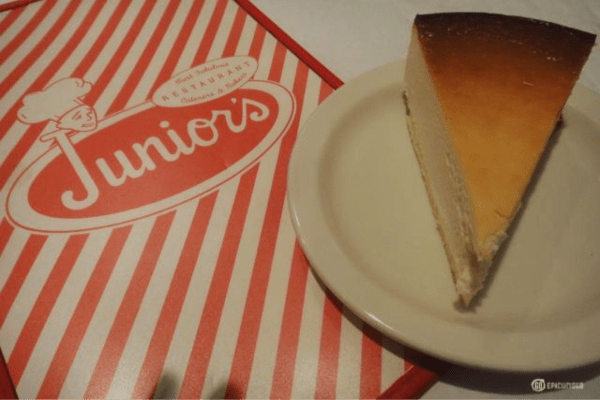 Run by third generation Alan Rosen, Junior’s is touted as “The World’s Most Fabulous Cheesecake” consumed by presidents, celebrities and tourists alike. I visited the original location on the corner of Flatbush and DeKalb, in Brooklyn, several years ago and since then enjoying a delicious slice has become a tradition on every trip to the Big Apple. Thankfully they have outposts throughout the city at Grand Central Station and Times Square making it easier to satisfy this indulgence. Overnight shipping is also offered for those times a trip to New York is out of the question. They offer a wide variety of flavors and seasonal creations but I always recommend you start with the plain original version and taste the true New York classic. 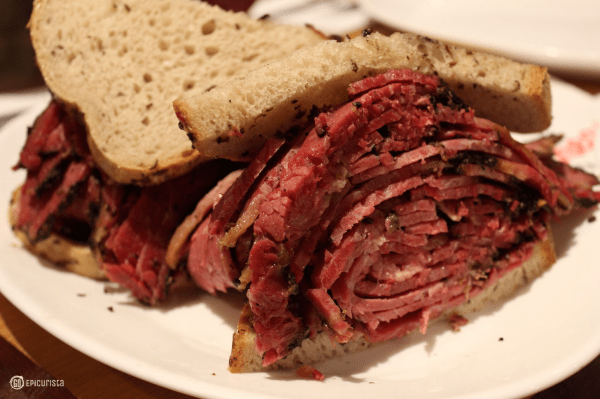 The piled-high deli sandwich is not the only reason people flock to Carnegie Deli. Their house made cheesecake is a great way to end a meal, so make sure to save room. It was creamy and dense and every bit like I imagine a bite of heaven would be like. Other Cheesecake on my Someday List: I hear Eileens Special Cheesecake and Two Little Red Hens are exceptional in their own special way. Little Italy is an iconic area of New York City and when you’re in the area, which sadly is getting smaller, a cannoli is a Must Eat. Actually, in any area of New York, don’t skip out on this Italian pastry with the flaky crunchy exterior and rich creamy inside. You can find them in miniature versions (my favorite because I can sample more!) up to gigantic ones. They can be chocolate coated, topped with chocolate chips or pistachios, powdered sugar and more. A New Yorker friend recommended a visit to Ferrara’s in Little Italy, the oldest bakery in NYC, famous for their cannolis since 1892. She advised they were on her list of Must Eat Food of New York and I couldn’t miss it. 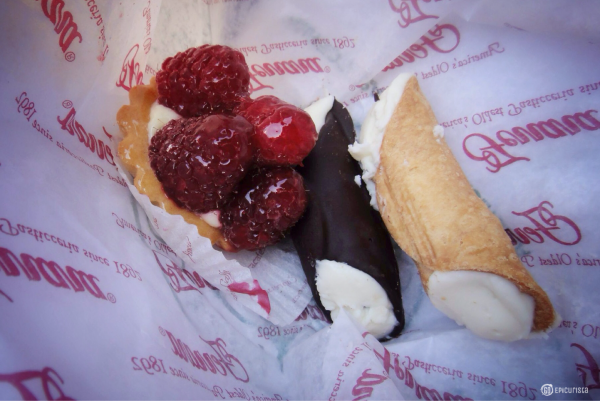 As we strolled along Mulberry Street, we found La Bella Ferrara and proceeded to enter the small pastry shop to oogle over the many types of cannoli and pastries in their cases. We made our selection and were quickly on our way to explore Little Italy. A few blocks later, we turned the corner on Grand Street and stumbled into a long line under a bright flashbulb neon sign that read “Ferrara” and immediately realized our mistake. A delicious mistake, no less, because it led us to sample these two similarly named bakeries side by side. A word of warning around New York, there are many similarly named businesses. We got lucky and had a good experience but always double-check the address to ensure you’ve arrived at the right place. To this day, we always laugh telling “The Tale of the two Ferrara’s” and those delicious cannolis. La Bella Ferrara is a small bakery which can get full very quickly, with an outside window for to go orders which is very convenient. The cannoli was no frills and simply delicious. They also make a good cappuccino. Ferrara Bakery & Café, as the name suggests, provides both the counter for to go service as well as a sit down experience in this two-story dessert heaven. The wait can be quite lengthy so it’s best to get your sweet bounty to go and enjoy it while strolling along this colorful neighborhood. 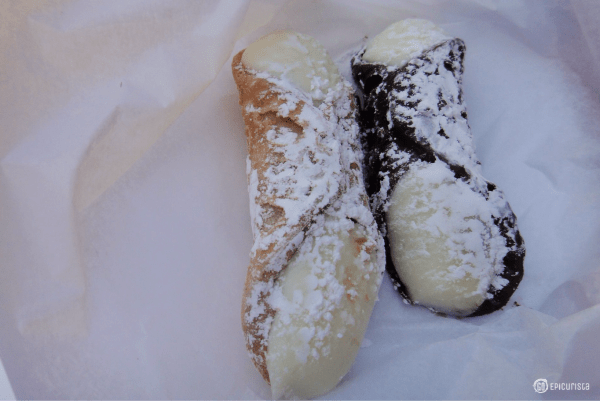 We sampled the chocolate-covered cannoli and the traditional, and both had a delicious flaky and crisp pastry with a well-balanced sweet ricotta cream filling. I’ve had bad cannolis before (I know! How is that possible?) with a too-hard shell, often a sign that they are not fresh, or cream which is either too bland or too sweet. These, on the other hand, were perfect. They even mix small chocolate chips in the filling for added treat. On my Someday List: Caffe Palermo, where owner John DeLutro is touted as the “Cannoli King” of Little Italy; Veniero’s Italian Bakery open since 1894 in the East Village also gets rave reviews. Time to do some more cannoli tasting! Food trucks and street food are a Must Eat Food of New York City. Yes, some say it’s a bit scary but I say GO for it. It may not be a transcendent food experience, but it is a rite of passage for first time visitors and on-the-run, short on time locals. You will see plenty of these carts all over the city selling a variety of meats on a stick and hot dogs. Pick the one that looks best to you. This was a fun stop for my sisters and I during our Girls Getaway “New York Themed Day”. 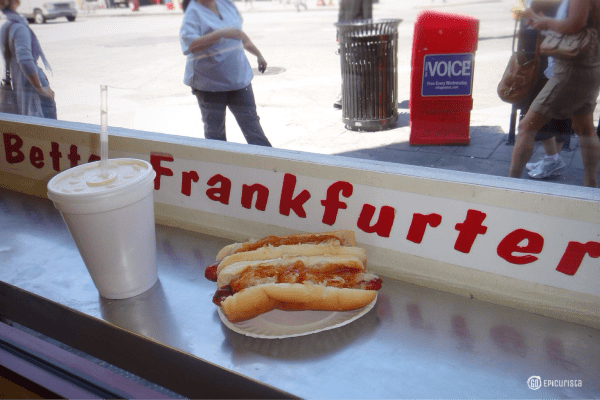 Once you’ve tried a street dog, your next stop is Gray’s Papaya. With an interesting combination of tropical drinks and frankfurters, this is no-frills cheap fast food available round the clock. Slim beef dogs, cooked on a flat fryer instead of boiled like the street dogs, which makes them burst when you bite into them are topped with mustard, sauerkraut and their signature onion relish. Many would argue whether we are still in a recession but nobody could argue that the recession special of 2 dogs and a 14oz drink for $4.95 is a great deal. The papaya in the name is for their special fruit juices offered, so don’t miss out on what I think is papaya juice as a refreshing pairing. Other flavors like pineapple coconut are available. Located at 2090 Broadway, between 72nd and 73rd Streets on the Upper West Side. Since 1932, this 83-year-old chain is the original ‘Papaya’ in town and just as good. You can get a series of toppings like cheese, chili and fried onion rings at their original location on 86th Street as well as their food truck rolling around town. 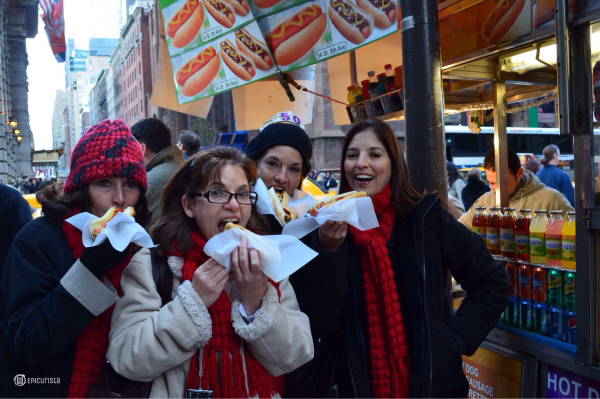 If these dogs were good enough for Julia Child to call the best Hot Dog in New York then who am I to argue? As you can imagine, this is just a small sampling of my favorite iconic Must Eat Food of New York. Everyone has their favorites and if yours are not on this list, please share in the comments below. Exploring the food scene will never cease to get old with all the new spots that open up around town, and yet you still find these New York traditional favorites, family run institutions that are as much entrenched in the city’s history as The Statue of Liberty or the Empire State Building. There is a reason why these places have long lines of people out the door, visited by tourists and locals alike. They have been around for decades to prove they are the real deal. I encourage you to GO discover for yourself. Do it soon though, as some beloved favorites have already closed their doors. GO #MakeSomedayHappen. You may love them or you may find another you like better, but either way I guarantee it will be a delicious journey. Do you have a favorite food or dining experience that starts with the letter A? Stay tuned for the next post in the Must Eat Foods Around the World A to Z challenge as we leave the USA and head to Germany. The letter B is for Berlin, Beer and Bratwurst. I will tell you all about our fun and unexpected night exploring the city of Berlin and what I discovered to be a Must Eat Food and Must Do in Berlin. Great series and off to a good start! BTW, the apple is the official state fruit of New York and from there you can deduce why NYC is called The Big Apple! Can’t wait to see the rest of the alphabet! Amy you just solved the mystery! I should have known it was that simple. Thanks for joining me on the A to Z blogging challenge. You rock!